In science and technology studies (STS), reflexivity is not the foremost political or ethical concern that it is for some postmodernists, feminists, anthropologists, or those earnest students of Bourdieu. For us, reflexivity is a practical methodological concern. When reflexivity is raised in our scholarly communications it is, without irony, about crafting scientific communications (i.e., scholarly accounts like articles or books) reflexively. This paper therefore is an actor-network account of making reflexive actor-network accounts, specifically, in the process of writing-up qualitative research findings. It is a paper about research. It is a paper about the research process. As our empirical contribution, we report on research we previously conducted and about the subsequent steps we took toward a (publishable) way of reporting it. 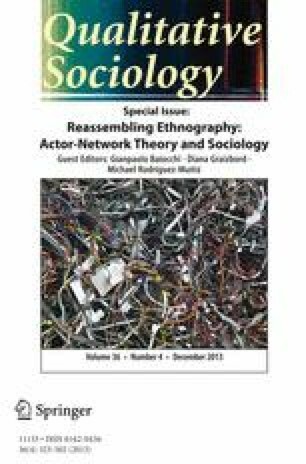 We are trying to honestly disclose how the process of preparing a reflexive account is more than merely a matter of cleaning-up the messiness of data, but also, and perhaps foremost, a process of finding, aligning, and occasionally distancing our accounts from our allies — in our case, actor-network theory (ANT) and reflexivity. eHealth Initiative. 2007. eHealth Initiative Blueprint: Building consensus for common action. Accessed at: http://www.ehealthinitiative.org/sites/default/files/file/eHiBlueprint-BuildingConsensusForCommonAction.pdf No longer available. Previously accessed 8 August 2009. Original available from authors. eHealth Initiative. 2009. About the eHealth Initiative. Accessed at: http://www.ehealthinitiative.org/about.html No longer available. Previously accessed 8 August 2009. Original available from authors. Currently available at: http://www.ehealthinitiative.org/about-us.html Accessed 10 November 2012. Lee, Kirby, and Lisa Bero. 2006. What authors, editors and reviewers should do to improve peer review. Nature. Available at: http://www.nature.com/nature/peerreview/debate/nature05007.html Accessed 9 Aug 2013. doi: 10.1038/nature05007.